So my crockpot has been working quite a bit in my kitchen these days. This recipe is easy and is also freezer friendly as well. Chicken if browned and added to the crockpot with the remaining ingredients before cooking. For a freezer friendly meal, it's just a matter of assembling the dish and then freezing. When you're ready to cook the meal, defrost and place it in the crockpot! Heat olive oil in a medium skillet and brown the seasoned chicken. Cook chicken just until browned on the outside. Place chicken inside a crockpot. In the same skillet with a little more oil, sauté the onions and garlic until softened. Add this to the crockpot. Add the remaining ingredients over the chicken. Cover and cook on high for 4-6 hours or low for 6-8 hours. Serve over rice or potatoes. * To make ahead/freezer meal - Prepare the recipe as directed as above but rather than placing into the crockpot to cook, place everything in a gallon sized freezer storage bag. Squeeze out any air, seal and freeze. 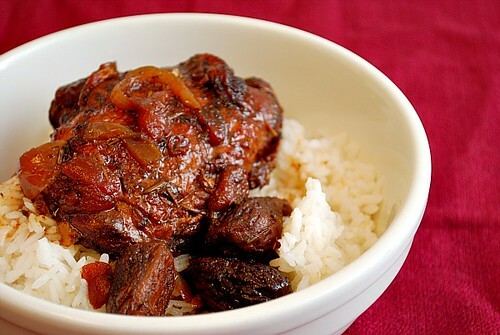 When ready to prepare, defrost completely and place in a crockpot. Cover and cook on high for 4-6 hours or low for 6-8 hours. Serve over rice or potatoes. I never comment on websites, but had to tell you this was AMAZING! I am not a good cook, but this changes everything!! Instead of figs I used Fig Butter from Trader Joes. Mixed it with the tomatoes and then dumped it in. Did I mention this was AMAZING???!!! This looks awesome. 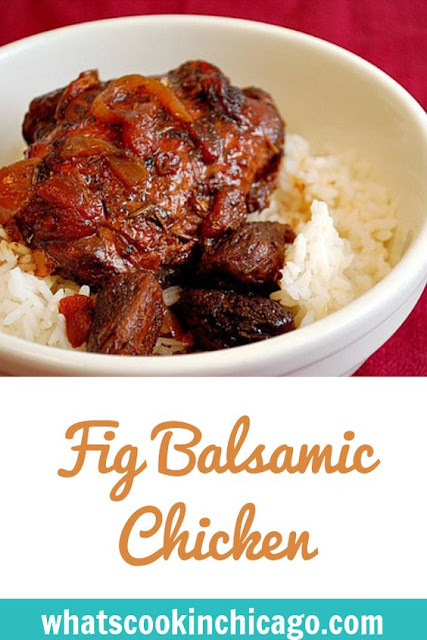 Love figs and love using the slow cooker! I had dried sour cherries on hand and basic balsamic vinegar. Delish! My family loved it! Next time will make it with the figs. Can you tell me how many this is supposed to serve? Thanks!